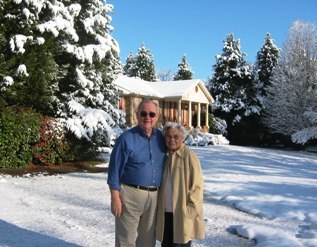 All of us were impressed with the week’s weather with record breaking snow in Washington DC and along the Eastern Seaboard. Aunt Becky Barnette worried about snow predictions for our area. 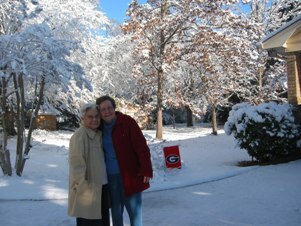 She has had much experience with leaving heat on, wrapping pipes, running water and having enough food. I was a little amused to see “Northerners” struggling with the snow as we remembered the numerous times they laughed at “Southerners” closing schools and not driving with one or two inches of snow and ice. We experienced an ice storm last year that broke tree limbs, felled trees and broke power lines. It was hard to maneuver with that. Our house is located on New High Shoals Road at the Watkinsville City Limits. We are located at the eastern terminus of the WEMC line coming toward Watkinsville from the west. When our house was new in the early 70’s, we had a number of power failures. Roads would be slippery. We would stay home and keep a fireplace going. We conserved bath water for toilet flushing and heated coffee and food on the wood heater. We knew not to open the freezer or refrigerator except for emergencies. Over the years, WEMC has cleared many trees and has many more customers. Power failures are much less frequent though we have an occasional outage for an hour or so, i.e. : the 09 Ice Storm and a Thunder Storm in the Fall of 09. Our reaction is to call WEMC and report it and the lights usually resume in an hour or so. Aunt Becky spent Friday night at our house. The snow had started around 3-3:30 PM and was coming down on a regular basis. We watched it from the windows. It was a pretty sight. Aunt Becky’s anxiety gave way to amazement. 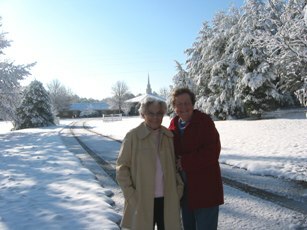 She said she did not remember this much snow –without ice- since the late 30’s. I was doing some home work at the computer and Betty prepared a hot meal. As darkness started to set in and we were preparing to go the table to eat, the power went off. We called WEMC and reported it. Others had reported it; but only a few which was reassuring that it was not widespread. At times like this, we find out which flashlights and battery radios will no longer work. We also discover that the lamp oil and candles have burned down. 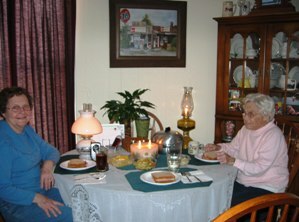 We proceeded to set up the lamps and candles and started to eat. 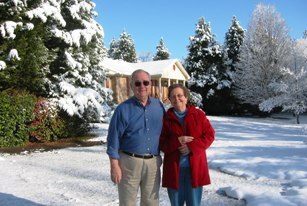 Aunt Bert Dellinger called from Lexington, KY, to check on Becky and talked to us briefly. We ate our meal and then relaxed for over an hour. We did some limited reading and talked. The house was quiet without television, electric motors or the computer working. Of course, it does bring feelings of isolation and anxiety about how long it will last. We were planning to bring the Kerosene Space Heater from the basement and set it in front of the Fireplace Insert. The heater was purchased about 4 or 5 years ago and has never been used. We resolved to bring it outside and fire it up when the weather was better and test it. Around 8-8:30, the power came back on with a rush of lights motors, television etc. We were very appreciative of the WEMC personnel who came through. One had even come to our house and checked to make sure the lights were on. On Saturday morning, the snow was beautiful in the sunlight. Knowing the temperature would rise, we proceeded to take some pictures. Overall, it was a pleasant and fun experience though there were some anxious moments.